Just three hours from Grand Canyon country and two scenic hours by car south of Las Vegas, with en route views of the Hoover Dam and Lake Mead, this picture-perfect NW Arizona desert ranch, located at the foot of the Mohave and Hualapai mountains, enjoys a warm temperate climate during the colder months, making it ideal for a winter escape dude ranch vacation. Designed to resemble an old western township, the ranch prides itself on greeting guests like friends and having them leave like family! 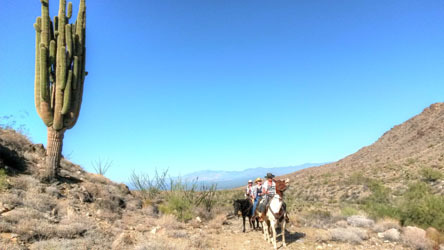 Boasting over 360,000 acres of stunning desert vistas, the Stagecoach Trails Guest Ranch riding program is second to none and can easily accommodate beginner riders along trails of cactus strewn landscape to trotting and loping among desert washes for more experienced riders. Expert wranglers are always on hand to safely guide riders and help them gain new skills and confidence while deriving the utmost enjoyment during the twice- daily riding sessions. 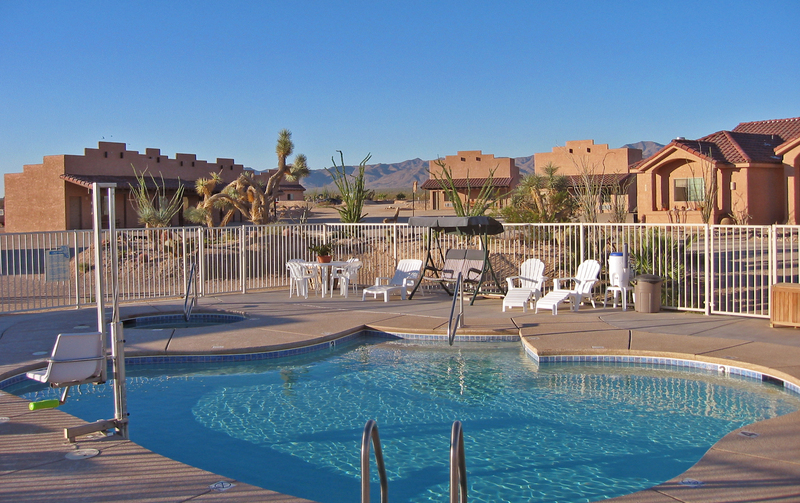 Back home at the ranch, guests can enjoy a varied assortment of activities which might include a refreshing dip in the outdoor pool, a soak in the hot under starry desert nights or billiards, ping pong and nightly socializing at the Frontier Lodge. Outdoor fun includes archery, cowboy action shooting, wagon rides, mountain bikes, hiking, rental ATV’s and exciting gunslinger nights for a real taste of the Old Wild West, plus skilful demonstrations of roping and bull-whipping in the courtyard by the wrangler staff. Stagecoach Trails Guest Ranch offers an all-inclusive package which includes accommodation, twice-daily riding and three hearty, delicious meals per day plus all the many ranch amenities. Guest accommodations, which can house various sized families and groups, consist of western-themed comfortable rooms that all come with a patio and rocking chairs, including some with courtyards and extra-large bathrooms. 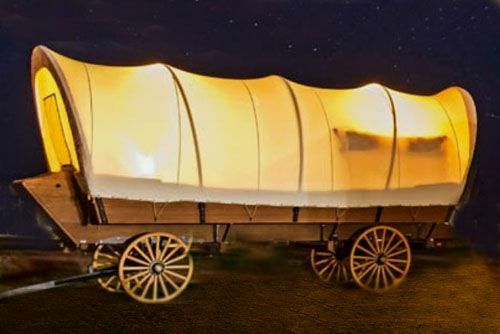 For fans of Glamping, the ranch has recently introduced a large, authentic Conestoga wagon that once hauled freight during the 18th century, which now sleeps five comfortably and comes fully equipped with heating and A/C for those who want to experience first-hand the thrill of pioneering like in the old days out west. Owners JP and Tricia McCormick, their sons and dedicated staff work very hard to ensure their guests are treated to the best possible Old West experience and the glowing reviews which the ranch regularly receives is a testament to their success. For this and other unique ranch properties, look no further than Ranchseeker to help you find the perfect ranch for your perfect ranch vacation.